﻿ What is the Best Thule Bike Rack in 2018? Being outdoor enthusiast ourselves we are big fans of the functionality, design and outstanding quality if the Thule bike racks as well as their other products, which are guaranteed to keep your bikes safe, dry and scratch-free during transportation for long-distance or mountain cycling. In today’s feature we will review five of their most popular bike racks you can find on Amazon or any other of the well-known online retailers. The Thule 2 Bike Platform Hitch Rack is an interesting little piece that doesn’t seem to be able to do much, but is amazingly functional and versatile. It comes at a rather steep price, but it doesn’t get any better than this in terms of a Thule bike rack. All the company’s knowledge in designing bike racks goes into this model as it is high-quality as it can get. The ultra-compact holder with integrated cable lock secures up to two bikes without making frame contact. The hitch Switch TM lever folds and stores platform when idle or tilts down for easy rear vehicle access. A reinforced tray provides maximum strength and rust-free protection. The adjustable wheel strap quickly and easily secures the back wheel to the tray. 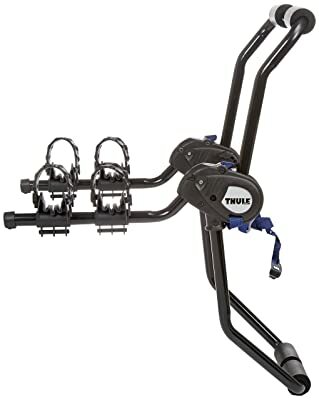 This Thule bike rack is compatible with all 20 to 29-inch wheel diameter bicycles with up to 3-inch wide tires. In addition it is easy to assemble and with the extra option for customization. 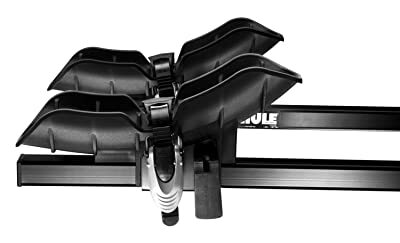 The Thule 990XT Doubletrack 2-Bike Hitch Mount Carrier is a functional 2-bike holder with reinforced wheel trays that serve as platform to eliminate bike-to-bike contact. The wheel trays slide independently along platforms to minimize bike contact. A hitch switch lever folds and stores platform when not in use. Bikes are transported via vehicle’s 1-¼ -inch or 2-inch receivers. This Thule bike rack is easy to assemble and mount, built with the main focus of transporting a bicycle without any damage to the frame. The system benefits from a sturdy bike mounting method, thus minimizing movement. Another advantage of this model is that it works well with non-standard bike frames. 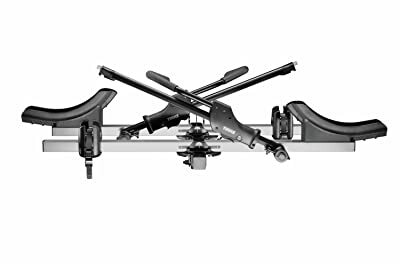 The Thule 911XT Passage 3 Bike Trunk Mount Carrier is one of the more affordable Thule bike rack models with the capacity to carry up to 3 bikes on the trunk or hatchback of the vehicle. It benefits from soft rubber cradles and an anti-sway feature to protect the bike’s frame while holding it securely in place. One of its best features is the patented FitDial mechanism provides the perfect fit to the vehicle. The arms fold down conveniently when not in use. Their construction allows for a wider range of bike frames to be accommodated – from heavier mountain bicycles to smaller children models. 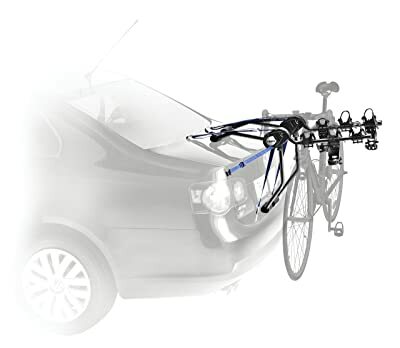 This Thule bike rack is an easy-to-install functional holder with value-added features. Vinyl-coated buckles provide firm hold to vehicle and protect against scratches and a six strap system secures rack to vehicle. The Thule 910XT Passage 2 Bike Trunk Mount Carrier is pretty much the same as the previous model with the exception that it holds up to 2 bikes at a time. Soft rubber cradles protect bike frame while holding it securely. Stay-put anti-sway cages prevent bike to bike and bike to vehicle contact. The soft cushion leg pads protect both trunk and hatch from scratches and damage. The unit boasts Thule’s easy-to-use, patented FitDial hub adjustment system for a perfect fit to your vehicle exterior, quick installation and an exclusive push-button feature for for attaching and detaching the carrier arms. The main benefit of Thule’s trunk mount bike carriers do not require a roof rack, are easy to install and offer easy access to bikes. Overall, it is both affordable and efficient. 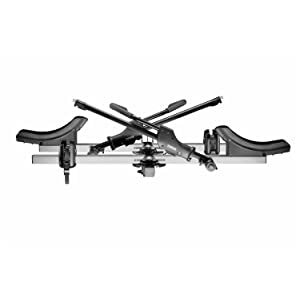 The Thule Parkway Hitch Bike Carrier – 4 Bike is an ideal multi-bicycle Thule bike rack. Its solid construction makes for an increased storing capacity. This model comes with a lifetime warranty from the manufacturer. Though simple in design it lives up to its cost and can safely and efficiently accommodate up to four bicycles with minimal to no movement. The dual arm design eliminates the necessity for top tube adapters on certain bikes. The tie-downs are included in the unit, although it might be a good idea to upgrade with the zip stick for more bike stability. It is user-friendly and easy to install. The construction is sturdy and works well with heavier bike frames. These five racks are just a small fraction of the vast assortment of accessories the company offers to simplify the transportation of gear and equipment for outdoor enthusiasts. For a full catalog of their items we suggest heading down to our best bike carrier reviews and browsing through the different categories. One thing is for sure, though – once you go Thule you’re most certainly not going to go back! You are here: Home / Automotive / What is the Best Thule Bike Rack?